Below is a list of documents you will need to bring with you to Australia, depending on how long you plan on staying and what you plan to do. Naturally, documents such as your visa and passport are essential, whereas other documents will depend on the person, their planned activities and their visa type. It can be a good idea to obtain an apostille stamp on your important documents (birth cert, marriage cert etc.). An apostille is an authentication stamp that proves your documents are legitimate. As many Australian officials and government agencies are often unfamiliar with foreign documents, an apostille will assure them that your documents are genuine. You can obtain an apostille from either your home country’s government that issued you with your documents, or from an apostille agency. (i) Keep hard copies of all your important documents, particularly your passport and visa. Keep one set in your home country if possible, perhaps leaving them with a friend or family member. 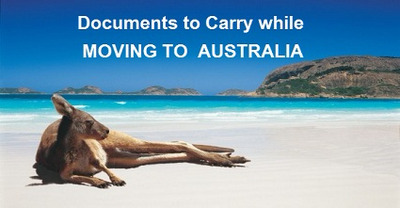 Bring copies with you to Australia as well, but keep them separate from the original documents. Copies are very useful should any of the original documents get lost or stolen. (ii)Make digital copies of your documents. Scan your important documents onto your computer and save them either onto your computer or a USB/external hard drive. Again this can be very useful if you lose the originals or hard copies of your documents. (iii)Store all documents and copies (both hard and digital) in a safe place at all times. (iv)If you are arriving in Australia from a country that does not speak English( Like Nepal), you must have your documents translated to English. Your translator must endorse the translation with their full name, contact details and qualifications. If you use a translator within Australia, they must be accredited. Common Foundation Pvt.Ltd. is a career based Educational Consultancy based in Putalisadak, Kathmandu Nepal can be contacted at 4010675 and 9845536915. Till today, there have been 14891 visitors (25020 hits) on this page!